In large heatproof pitcher, mix red gelatin, red soft drink mix and 1 cup of the sugar. Pour 2 cups of the boiling water over mixture and stir until dissolved. Stir in 2 cups of the cold water. Pour mixture evenly into 8 (3- to 5-oz) paper cups. Rinse out pitcher. In pitcher, mix blue gelatin, blue soft drink mix and remaining 1 cup sugar. Pour remaining 2 cups boiling water over mixture and stir until dissolved. Stir in remaining 2 cups cold water. Pour mixture evenly into 8 (3- to 5-oz) paper cups. Freeze cups until slightly firm. Insert 1 lollipop stick into each cup. Freeze until firm, 8 hours or overnight. If you have freezer pop molds, you can use them instead of paper cups. Mold sizes vary, so you may not get 16 pops from this recipe. 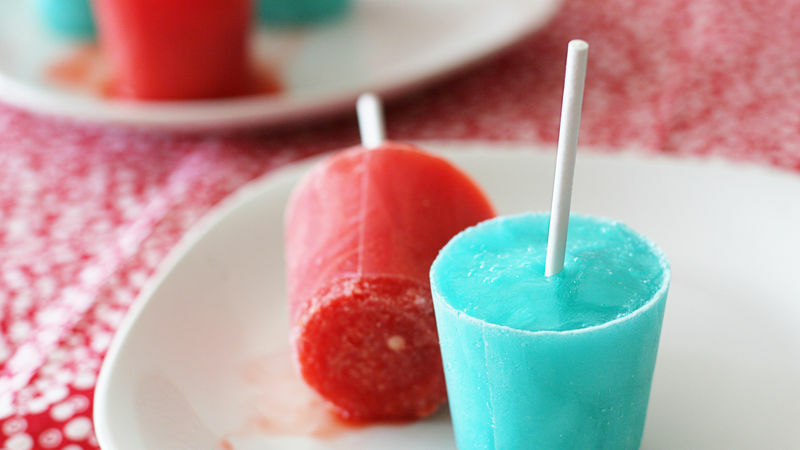 Use other flavors of gelatin and soft drink mix to make other colors of ice pops.